I can hardly take it! Cookies and milk have been among my most raging pregnancy cravings so making a crochet version of my favorite treat was a must! While I’m 70% making this blanket for me and my sweet tooth, eventually I hope to snuggle under it with my little nugget! That being said, I want it to be bright and fun. Anyway back to the cookies. The important things. This block is worked in two parts, the cookie then the square. Enjoy the video tutorial and the written pattern below! This project is so cute and fun to make! 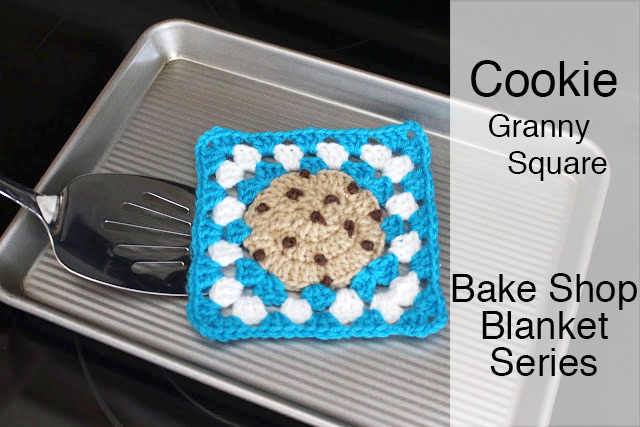 I hope you all crochet some cookies to share with your friends and families!Thanks for checking out this installment of the Bake Shop Blanket Series! Click HERE to see the whole project finished and get all the other squares!